Are you still squeezing your toothpaste manually? Squeezing toothpaste manually sometimes waste too much toothpaste, and the residuum is unhygienic. This little squeezer can help you deal with these problems and allow you to quickly, easily and neatly dispense just the right amount of toothpaste directly onto your brush. Very practical, excellent for home use in toilet or bathroom. 100% Brand new and good quality automatic toothpaste dispenser with 5 toothbrush holder set. One-touch automatically squeeze appropriate amount of toothpaste, very convenient. 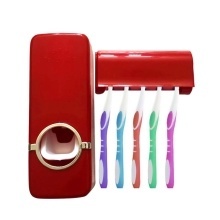 The holder can simultaneously hold 5pcs toothbrushes. Comes with adhesive pad to facilitate the use of adsorption of the different walls. Easy to install to the wall, no tools needed. No more wasted toothpaste, a great life helper in your home. 1. Toothbrush and toothpaste are Not include! 2. For the first time use, you need to press 3-5 times, and the air will be discharged to squeeze out the toothpaste tube. 3. If you can not squeeze out the toothpaste, please manually squeeze the toothpaste tube until the toothpaste exports a small amount of toothpaste.